Help! Send scotch tape! And 3x5 glossies! The problem with Martin Luther King Day is, it's in the middle of freakin' January and is generally observed with some kind of political rally. And much as I'd like the Mermaid Girl to get a taste of mass activism at an early age, dragging her out to a rally in the pouring rain takes more dedication than I can muster. Fortunately, Ginger's mom took pity on my temporarily single state this weekend and offered to have MG over on Saturday to join her and Ginger in making...Martin Luther King Day cookies! Which I thought skirted perfectly that thin line between child-friendly adaption and uncool trivialization. So: The hammer is the Hammer of Justice. The bell is the Bell of Freedom. 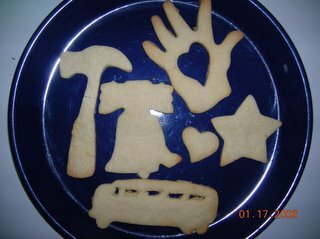 Ginger's mom couldn't find a musical-note cookie cutter, but she did have a heart for the Song of Love Between my Brothers and my Sisters. The hand is for people walking hand in hand, or joining hands. The star is, who knows why, stars are just nice. And if I have to explain the significance of the bus, you should probably just read this. There were also some fish in there (not pictured because they, er, got eaten). Ginger's mom said she couldn't think of a good reason for the fish, she just liked them. But then we remembered this radical tract about the power of collective action. RedHeadDread also commemorated the great Civil Rights leader's life with baked goods this year. What with the coldness and dampness of the season, baking for MLK Day might not be the worst tradition to start, no? And while the stuff's in the oven, everyone can sit on the couch and read books like this (MG's current Favorite Book Ever) and this. You hit on my two favorite MLK books! I'm using a United Streaming version of Martin's Big Words (but I show the kids the physical book too). I'm reading The Other Side to 4th grade - it's perfect for teaching inference! You have great taste in books! Wow, thanks, Guusje! That's a big compliment coming from you. Inference! That's perfect! And I may steal it sometime if that's okay. The Other Side is so understated, yet there's so much there. I did a little of that with MG (like, "Why do you think the mom didn't want her going over the fence?") but a lot of it is too sophisticated to discuss with her. I think she gets it in a nonverbal way, though. And she *really* gets the story of friendship. I haven't heard of United Streaming-- clearly I need to keep up better! That's a great tradition. You were very creative in your designs. The illustration in Swimmy reminded me of the version of Aesop's fables that my mother used to read to me. I remember the fish that grew wings and flew out of the water. Too bad some people are against MLKD. I think it's powerful to listen to the old recordings of his speeches. He had a very powerful and compelling voice.